Ocho Rios is Jamaica's most visited cruise destination. Typically, there will be over 100 cruise ship calls in a given year bringing some 300,000 cruise passengers to the area. According to local tradition, the first cruise passenger to arrive in the area was Christopher Columbus. In 1494, he landed at nearby Discovery Bay. During his fourth voyage to the New World, Columbus allegedly was stranded in the area for a year after his ships were damaged by a storm. Based upon Columbus' landings, Spain claimed Jamaica and began a colony in the area in 1509. The British, however, captured the island in the mid-17th century. Again, according to local tradition, the decisive battle was fought on the beach near Dunn's River Falls, today the area's most popular tourist attraction. No one really knows why the area is called Ocho Rios. The name means eight rivers in Spanish but there are only four rivers in the area. One rather unconvincing but popular explanation is that the name is an English corruption of the Spanish name for Dunn's River Falls - - Las Chorreras (The Waterfalls). 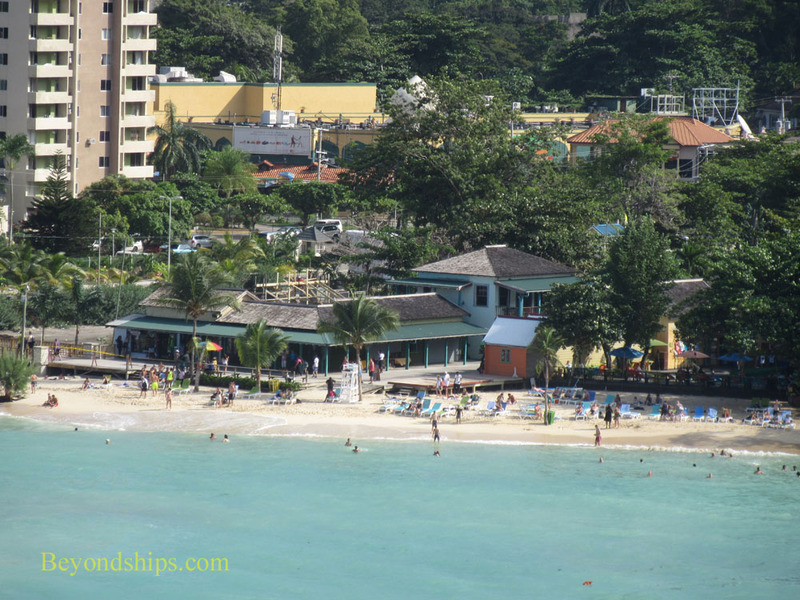 Located in St. Ann's Parish on the north coast of Jamaica, Ocho Rios was until fairly recently a sleepy fishing village dominated by a nearby bauxite mine. Today, it has grown to a community of about 10,000 permanent residents and numerous transients staying at the various luxury resorts that line the coast. The bauxite mine is closed and there is little commercial fishing. Tourism has become the main industry. ﻿Above: Ocho Rios is also known for its luxury resorts and hotels, some of which can be seen from the cruise port. 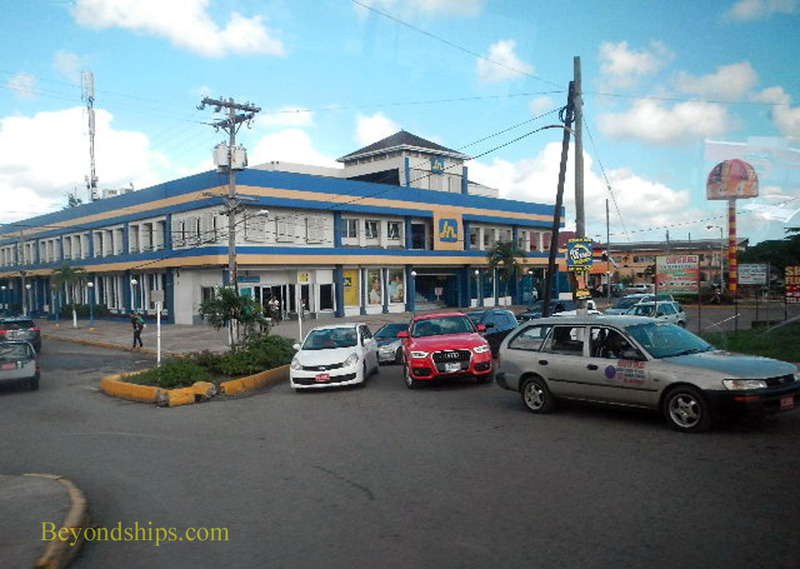 Downtown Ocho Rios has four craft markets but for the most part, it has been commercialized with shopping plazas and branches of some of the shops found in seemingly every popular Caribbean port. Reportedly, some of the plaza owners pay taxi and bus drivers for each cruise ship passenger they deliver to their plazas. Local vendors can be quite aggressive. To simply ignore them is a sign of disrespect and since showing respect is considered very important in Jamaica, it can cause bad feelings and sometimes a hassle. Therefore, a polite “No thank you” as you continue to move along is usually the best course of action. Cruise passengers are sometimes approached by people offering to sell drugs. While the island has the image of a relaxed attitude towards getting high, keep in mind that Jamaica actually has quite stiff drug laws.